The cheer megaphone is an important piece of equipment for any cheer squad. 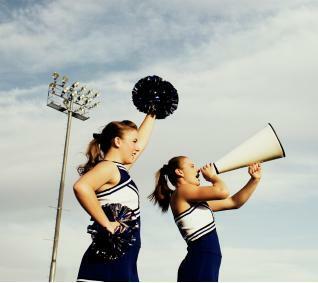 A cheer megaphone will allow you to be heard easier by the crowd and can be a part of your routine if your squad is participating in a competition. We know that a megaphone was in use at the first display of cheerleading in the late 1880's at Princeton University during one of the first football games. However, its use for cheerleading did not become popular until later in the 1900's. Its use was popularized, presumably, as major Universities began expanding their campuses in the form of giant football fields. You should use a megaphone in your cheers whenever you want to especially project your voice. Good cheers for using a megaphone are cheers where you want the audience to participate with you because they have to hear you well in order to know what's going on. Generally, one cheerleader uses her cheer megaphone while the rest of the squad does the motions. Stand still while using her megaphone. Bouncing will cause the sound to reverberate. Hold the megaphone up and towards the crowd. Hold the megaphone in one direction. Don't "scan" the crowd trying to shout at all parts of the crowd. This makes the words fade. Use the megaphone until the very last syllable of the very last word of the cheer is pronounced. Otherwise, the words will fade. If your squad is young, you can buy foam stickers in your team's colors and with the appropriate theme of the sport for which you're cheering. Foam stickers are an easy way to decorate because they simply stick on. This is a fun activity to build squad unity. Decorate your megaphones in the spirit of the season! Buy "Santa Clause" trim for Christmas and use super sticky tape to put it around the bottom edge. Or add a removable decal for another holiday during the year. Decorate your megaphone for special games. For example, if your school is doing a fundraiser game, you can decorate your megaphones in honor of the cause you're raising money for. Of course, if you're going to decorate your megaphones, you'll want to buy smaller megaphones for each girl that are made of hard plastic. Save the larger megaphone for one girl, usually the squad captain, and keep it with your game equipment to take it wherever you go. The Cheerleading Company sells megaphones in four different sizes. They also sell what they refer to as pep phones; these are small megaphones that are perfect for a peewee cheerleading squad. You can customize your order with your team's mascot and colors. Team Sportswear also sells megaphones in four different sizes as well as pep phones. They also offer an online logo gallery of sorts, so you can completely design your team's megaphones online using their clip art. They make customizing your megaphone very easy.